Now that the Spring run is drawing to a close and we enter the warmer weather patterns of Summer it's important that you understand the faster running Summer salmon and strategise your ambush points and persistency levels accordingly. Take the Dunkeld House beat as an example of what I'm meaning here. This lower warmer water has basically divided the beat into 3 serious fly fishing ambush points. The main one is the amazing Cathedral Stream where any running salmon has to swim up through a 20 yard broken water channel which lies directly off the Cathedral's stone riverbank wall. The shallow and undulating riverbed features of this pool are perfect for stopping even the hardest running salmon which is even more enhanced by the 450 yards of fast thin water directly downstream that salmon have to battle up through. In addition to that I'd defy any Scottish salmon angler to say they've fished a pool anywhere in Scotland that's got the same charm as the Dunkeld House beat's Cathedral Stream and it looks as if a chunk of the River Dee's perfect shallow riverbed has been transplanted into the Tay! Add in a perfect flow for the fly, the bells of the Cathedral, amazing natural native tree clad hillsides and the commanding Telford Bridge and you've truly something unique! The other two fly fishing hot spots for a great chance of a 'stopper' on Dunkeld House are at the tail of the Rock Pool & the tail of the Lady pool where there's also a fair chance of an encounter with hard running Summer River Tay silverware! This is a truly magical time of year when the fly comes into a class of its own and well presented small flies are the order of the day. 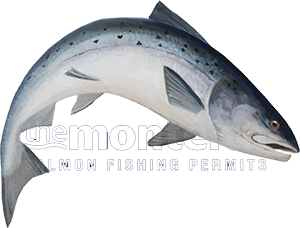 This is the time to figure out on any beat exactly where a hard running Summer salmon is likely to appear and stop. Now's the time to ignore the other areas of a salmon beat that would have been attractive in the higher & colder water levels of early Spring. This is now also the time for a little dark fly approach to highlight against the brighter light conditions and the time to get rid of the salmon fly dressing 'bling' and keep the emphasis on 'subtle' small salmon fly presentation. Often I've seen the second, third or sometimes even the forth swing through a pool over the course of the day was the attempt that brought the desired result. With that in mind you've go to understand that once a pool is fished it means nothing if a salmon hasn't cooperated as fish can move in at any time without them necessarily even showing themselves. In addition to that salmon that have ignored your first offering can all of a sudden 'switch on' for whatever reason or react better to a different fly pattern so never 'write off' a salmon lie as it's only ever a matter of time before another fish get's caught there. In salmon fishing and even during the best of times you've still got to take a measured 'long game' approach and understand that how one split second moment of 'insanity' from a salmon can be the 'fine line' difference between a fish or a blank. Get your 'water coverage' movement in good order and stay focussed as you force your fly to methodically 'scout' through all the salmon pools. Take note where you've seen a fish and try to show it something different later but keep going with an underlying sense of confidence due to the fact that sooner or later a salmon is going to react favourably to your efforts.